I would like to start my post this week with a light discussion on simplicity, specifically simplicity which relates to food. This is something which can elude me at times as I tend to make every meal an event, whereas my minimalist husband prefers keeping things simple, particularly what he eats. The up-side of this of course is that he is as happy with beans on toast as he is presented with something far more elaborate, so I really can’t complain. As much as I can argue with my husband that every meal should be an affair to be remembered, he does pose a good argument. Firstly he says, a meal can be just as much of a celebration whether it’s a sliced tomato with a little extra virgin olive oil and sea salt sprinkled over it, or indeed a slow cooked crispy skin duck which has taken five hours of labour in the kitchen. His argument is just because it takes less time to cook doesn’t mean it isn’t special. You can’t really argue with that. So with this thought in mind I would like to continue my exploration of the Russian zakouska table with a simple and beautiful salad. The Russian cucumber and radish salad is one of the fresher, more vibrant dishes of the zakouski menu and it made a regular appearance on my family table as I was growing up. It is also one of the rare zakouski dishes which are eaten raw as many of the other dishes including the salads, are usually cooked. It has a short list of ingredients and takes very little time to put together, yet remains so authentically Russian. I love to slice the cucumber and radish very thinly, then combine them with even thinner pieces of spring (green) onions. The dressing is nothing more than a simple light sour cream with finely chopped fresh dill mixed through with some salt and pepper. So simple and so good. My choice of sour cream is always light as I believe it allows the crisp radishes and cucumbers to shine rather than be weighed down by the buttery full-fat version. 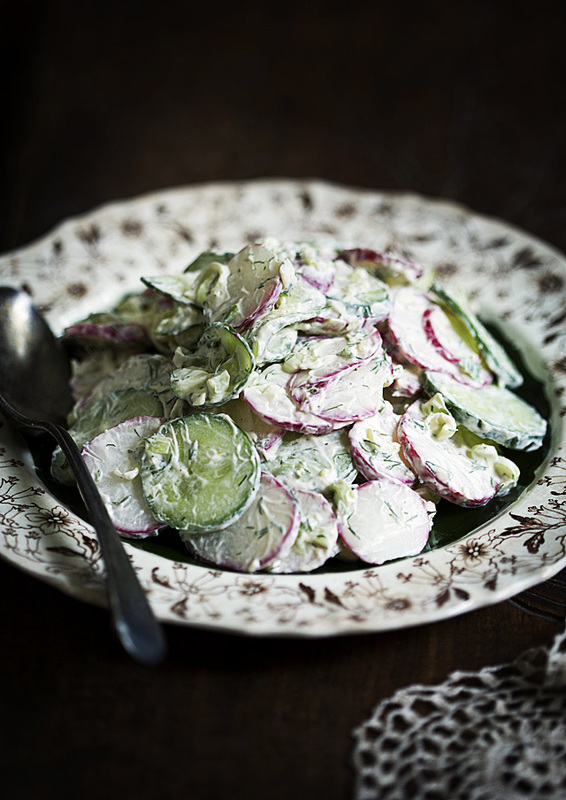 The Russian Cucumber and Radish Salad works beautifully as a side to chicken and lamb or as part of a zakuski spread. A gorgeous dish for spring and summer when radishes and cucumbers are plentiful and it looks very pretty on the table. Best served as soon as it is made as it is freshest and most delicious this way. Combine all ingredients until the salad vegetables are coated evenly. Serve immediately. I wanted dark and moody for this image and the inspiration was the dim old dining room at the Russian Catholic Centre in Melbourne’s Kew where the Sunday after-church service lunches would take place. My childhood family weren’t huge church-goers but as we were part of the Russian community it was expected of us to make at least semi-regular appearances at Sunday service. The lunches were always enjoyable and I do have fond memories of both the huge house and grounds the church was (and still is) set on as well as the food which appeared on the table for the congregation to share. The antique English plate, spoon and doily are from a local op shop and the surface is an engraved piece of timber originally inset in an antique cupboard I spotted in my (hoarder) neighbour’s carport. He happily gave it to me when I asked for it, informing me it had been in his parents home for many years and that he’d had trouble simply throwing it away. I’m so pleased it sits in my prop cupboard instead of landfill. Camera used is a Canon 5D Mark 3 with a 100mm lens. The only light used in this image is window light. i’ve had this with just cucumbers but i like the addition of radishes! This is such a wonderful side! A great alternative for the classic tzatziki we’re using here in Greece. Great post, bookmarked!